Sie sind hier: Start - Ausgabe 19 (2019), Nr. 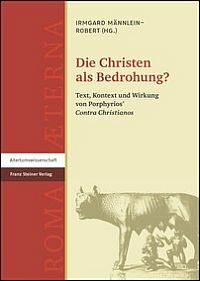 4 - Rezension von: Die Christen als Bedrohung? Irmgard Männlein-Robert (Hg. ): Die Christen als Bedrohung? Andrew Smith, in his "Porphyry's Metaphysical Objections to Christianity in Contra Christianos," appears to further develop his excellent "Objections to Christianity on the Eve of the Great Persecution." He explores Eusebius' implication that Porphyry didn't attack doctrine, but rather the Christian Scriptures (31). Smith begins with Porphyry's claim, as reported by Theophylact, that as the Son of God was neither proforikos or endiathetos logos, he could not be even a logos (33). 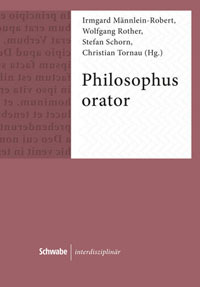 He examines similar arguments employed by Nemesios and recorded by Psellus, as well as the use of the terminology in Plotinus and elsewhere in Porphyry. Smith speculates that the logical extension of this would have been a similar objection to the incarnation of Christ (37). While an objection to the incarnation would not exactly be unexpected from a member of a school that diametrically opposed divinity and flesh (e.g. The Anonymous of Macarius Magnes, Apocriticus 4.22; Julian, Contra Galilaeos 276e), Smith indeed brings another useful facet of Porphyry's objections to light. Aaron P. Johnson develops a theme from his recent monograph in "Implications of a Minimalist Approach to Porphyry's Fragments." He lays out his first principle as "The material drawn from other authors who clearly had a high level of interest in Porphyry [É] but which nonetheless does not name Porphyry must also be removed from our inquiry" (47). He specifically points out "The removal of fragment 1 alone carries considerable weight in shifting (if not removing altogether) a basic assumption of much modern scholarship on Porphyry's anti-Christian agenda" (53). Johnson notes that losing many of the fragments that engage the Christian Scripture removes the foundation for assuming that Porphyry engaged those Scripture systematically and thoroughly, verse-by-verse, contra Smith in this same volume (55). Similarly, the minimalist approach removes "nearly all negative statements about the Jews" (56), and Johnson drives home the point that Porphyry held an "otherwise positive stance toward the Jews in all of his other writings" (56). Whether or not it is the goal, in practice the minimalist approach thoroughly sanitizes Porphyry. In dealing with controversial topics, Johnson's citations of differing opinions seem rather selective, which limits the impact of his own argument. He writes under the heading of politics that "the unnamed philosopher who delivered a three-book polemic against Christianity to the court of Diocletian should not, on the current evidence, be identified with Porphyry" (54), but the contrary arguments for Porphyry being that philosopher that Johnson presents in the footnote are articles and chapters dating back to 1959, rather than the recent monographs of DePalma Digeser and Simmons. Successfully engaging those fuller arguments would strengthen Johnson's own case. With "Eusebius' Porphyry", Ariane Magny engages in a presuppositionalist analysis of Eusebius. She presupposes that Eusebius' citations of Porphyry were disingenuous: "Even if he means to offer an impartial account, we may assume that Eusebius made a personal selection from Porphyry, which would have allowed him to portray the man negatively. Eusebius' method is therefore treacherous: he claims to be reporting objectively for the purpose of exposing the truth (Christianity), which will become evident to anyone from a comparison of Greek and Christian doctrines, but he still selected the passages he quoted" (264). This "treacherous" method of citing selected passages at weak points of an opponent's argument is, of course, employed by more than a few scholars in the modern academy as well. This is a continuation of the methodology employed in her monograph of 2014, where she treated Eusebius, Jerome, and Augustine similarly, insisting that when they argued against Porphyry, by virtue of that argument, their statements could not be trusted. Magny does helpfully point out transmissional issues adding to the problems with Eusebian quotations (265). These contributions are indicators that unlike many edited collections, this is a comparatively exciting volume, and one that may spark some interesting debates in the faculty lounge. Barring a few minor spelling errors, e.g. "objections raise by Macarius' opponent" (46), the editing is of a high standard overall. The index is extensive, though unfortunately lacking information on modern authors. This volume is recommended for both libraries and specialists in Porphyry, who will want their own copy as well. Pieter Willem van der Horst, BMCR 2018.01.30. Andrew Smith: Objections to Christianity on the Eve of the Great Persecution, in: The Great Persecution, ed. by D. Vincent Twomey / Mark Humphries, Dublin 2009, 33-48. Aaron P. Johnson: Religion and Identity in Porphyry of Tyre, Cambridge 2013. Elizabeth DePalma Digeser: A Threat to Public Piety: Christians, Platonists, and the Great Persecution, Ithaca 2012; Michael Bland Simmons: Universal Salvation in Late Antiquity: Porphyry of Tyre and the Pagan-Christian Debate, Oxford 2015. Although Simmons' monograph appeared after the conference the volume is based upon, the authors were able to incorporate the even later text of Matthias Becker: Porphyrios, Contra Christianos. Neue Sammlung der Fragmente, Testimonien und Dubia mit Einleitung, Übersetzung und Anmerkungen, Berlin 2016. Ariane Magny: Porphyry in Fragments. Reception of an Anti-Christian Text in Late Antiquity, Farnham, Surrey / Burlington, VT 2014, 33.